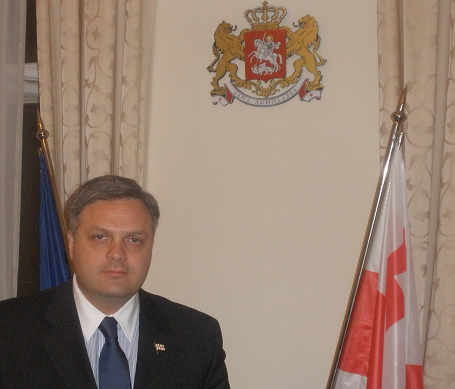 In the first half of March 2009, the Vice Prime Minister of the Georgian Government and State Minister on European and Euro-Atlantic Integration Giorgi Baramidze officially visited the Slovak Republic. We interviewed him on the current position of the Slovak Republic on Georgian integration into Euro-Atlantic structures, the prospects of NATO and EU membership as well as the impact of the August Georgian-Russian conflict on the integration process. Mr Vice Prime Minister, you have had an audience with the Foreign Affairs Minister Miroslav Lajčák recently. In this context, the Foreign Affairs Ministry issued a statement in which it backed Georgian EU and NATO integration efforts and welcomed the establishment of the committee NATO – Georgia. How do you assess the activities of the Slovak Republic in connection with Georgian integration into Euro-Atlantic structures? The meeting with Minister Lajčák as well as the expressed support of Georgian integration efforts from Slovak side is very important. The Slovak Republic intensively supports Georgian efforts to access the EU and NATO. We also highly appreciate the support of the territorial integrity and democratic development of our state. Obviously, we can do more for our cooperation. I hope that my visit and next visits, which will be conducted by our representatives in the Slovak Republic and vice versa, will offer us further opportunities for intensifying our collaboration. The opening of the honorary consulate of the Slovak Republic in Tbilisi was discussed at your meeting as well. What date is it scheduled for? The Slovak side plans to open the honorary consulate in April 2009. I hope that the Minister of Foreign Affairs of the Slovak Republic as well as the State Secretary of the Ministry will visit our country during the inauguration of the Honorary Consul and opening of the consulate. Subsequently, we will be awaiting the visit of the Vice Prime Minister of the Slovak Republic Dušan Čaplovič and the Economy Minister Ľubomír Jahnátek. What are the concrete results of the meeting with Mr Lajčák like? It’s most important to us that we were able to provide our Slovak partners with information on the real post-war situation in Georgia. We informed about the situation in occupied territories and what’s going on after the ethnic cleansing. We furthermore informed Slovak partners about the way of living of people in occupied territories, how the ethnic Georgians in the Gali region were oppressed and what the plans of the Georgian Government were like in this connection. We informed about the Russian militarization of these territories and Russian authorities’ decisions to build military bases in them, which is at odds with the legal commitments of the Russian Federation including the six point agreement brokered by the French President Nicolas Sarkozy. We also informed about the fact that the Russian Federation blocks European observers from the conduction of monitoring in occupied territories. And also this contradicts the ceasefire agreement, signed by the President of the Russian Federation Dmitry Medvedev, international norms and international law principles. We informed that our objective was further consolidation of democracy, reinforcement of democratic institutions, strengthening of the execution of law, the creation of further possibilities for press and media, reinforcement of non-governmental organisations and civil society, implementation of other economic, anti-corruption and security reforms. We discussed a whole range of questions. It is crucial for us that the Foreign Affairs Ministry of the Slovak Republic expressed the support of Georgian efforts to become a NATO member as in August 2008 the aim of the Russian Federation was not only to occupy Georgian territories, but also to take control of the whole territory and to prevent Georgia from becoming a NATO member. Via the war the Russian Federation wanted to control not just the whole of Georgia, but also the entire South Caucasus, i.e. the corresponding energy sector. The Russian Federation did not want Georgia to be the transit country of alternative energy carriers. We managed to preserve all of this, we saved our prospects of entering NATO, independence and sovereignty. Yes, we have got 20 percent of our territory occupied, but we are hoping that just temporarily and that this problem is to be solved in the short-term and not in the medium or long one. We hope that the whole of the civilised world, which condemned the recognition of the independence of Georgian regions Abkhazia and South Ossetia by Russia, will force the Russian Federation to change its attitude to the given questions and to quit the aggression against Georgia. Could you name specific steps that you have agreed on? We agreed on further cultivation of contacts and the conduction of consultations. We agreed on the fact that our relations would remain on the level necessary for information and analytical materials exchange. As I have already said, the Slovak Republic will uphold Georgia in its efforts to become a NATO member state. Mr Lajčák expressed readiness to visit Georgia, which will offer us the opportunity of providing him and Slovak colleagues with even more detailed information. He will have the possibility to acquaint himself with our country and its prospects even more. We’re tired of war, we want peace and stability, we don’t look back but forward, namely at the civilised European way of problem solutions appropriate for the 21st century. What are the impacts of the August conflict on the integration process like? Unfortunately, the Russian Federation managed to slow down the pace of Georgian NATO integration. Its goal was to stop this process, to control the entire Georgian territory and to topple the governmental power. However, it didn’t succeed. It managed to slow down the integration process, but it hasn’t stopped it. Nowadays, we have the NATO-Georgia Commission, established after the August war; we have the Annual National Plan thanks to which Georgia has the possibility to use the basic component of the Membership Action Plan (MAP). MAP stands for Annual National Plan multiplied by the number of years. We have achieved the basic component and therefore we have the opportunity to concentrate on the essence, namely the reforms. Our objective wasn’t to achieve the MAP but NATO membership. Georgian success is the achievement of the basic MAP element. It’s a compromise catering to both sides: In relation to Georgia since it got what it had really wanted and in relation to the Russian Federation which achieved that NATO had refused to give the MAP to Georgia. The Russian Federation was formally successful, but Georgia has really got what it aspired. Has the August conflict influenced Georgian acceptability for western partners? The war sparked rather ambiguous reactions. Everyone was shocked, everyone had lots of questions. Not all questions have been clarified so far, but many of them have been answered. People remember what Russian Federation’s aim was like and who did what. Crucial is the war investigation which the EU deals with and which is led by Swiss diplomatic representative Heidi Tagliavini. This investigation will help everyone to answer all questions. We hope that our partners won’t have any doubts as far as Georgia is concerned. Georgia has found itself in the front line of the confrontation between two ideologies, liberty and democracy on the one hand and totalitarianism and imperialism on the other. Unfortunately, such a confrontation exists. It is most perceptible in Georgia but also in Ukraine. We are directly on the border of these ideologies. The Russian Federation doesn’t want to lose those territories which it used to control and which are now moving towards the West and Europe. Europe wishes to accept these territories, but it is afraid of upsetting the Russian Federation. It at the same time realises that it would be unwise and not pragmatic to leave these freedom-loving and democratic states. If certain questions arise, we will explain our partners the situation, we will explain what’s going on, what the motives were like, when the war did actually start, whether in August or 15 years ago. Last preparations were launched yet in 2004. The construction of illegal bases in Georgian territory and the so-called railway, the bombing of Georgian territory, the shot-down of jets and perpetual provocations in our airspace, all of this was yet prior to August 2008. The last stage, the evacuation of people from Tskhinvali a week before 7th August, 2008, was incomprehensible to us in that time. Afterwards we understood that the reason was the war that was to begin on 7th August. That’s why the inhabitants of South Ossetia (Georgia) were evacuated one week in advance. That’s why separatists said that they would clear this territory in a few days. That’s why they conducted military exercises near the occupation line. This means that we answered many questions, but still a good deal of questions have remained unanswered. These have to be answered. We will do our level best to do so honestly, openly and transparently. We are hoping that Georgia will become an important point within the scope of interest of European observers, who will intensify their activities. We wish more transparency and internationalisation and that the problem with the Russian Federation is solved. We wish to make the Russian Federation flee from occupied territories in a peaceful way and to normalise life in these territories. The provision of the Article 5 of the North-Atlantic Treaty, according to which an armed attack against one or more members is considered an attack aimed against all members, is attractive for Georgia. Should the situation from August 2008 repeat, do you assume that western partners will directly intervene in the conflict? I am positive that if Georgia was a NATO member, the Russian Federation wouldn’t attack it. I am positive that NATO won’t apply the Article 5 in relation to the Russian Federation since it won’t attack any NATO member state. The Russian Federation isn’t by far the USSR and even the USSR didn’t have the guts to attack NATO. The Russian Federation is much weaker than the USSR. They know it very well. They wouldn’t beat Georgia either if we had state-of-the-art technology on the level of NATO standards. I am sure that the Russian Federation isn’t interested in assaulting any state which has already became a NATO member. When Georgia becomes NATO member, the Russian Federation won’t even think of forcible ways of pressure on Georgia. Instead of this, it will seek the advantages of mutual relations with Georgia as it searches for the advantages of relations with the Slovak Republic, Germany, Greece, France, Turkey and other NATO states. In the Russian Federation, bad people, who, however, aren’t crazy, have been making decisions about war. They are pragmatics knowing how to count money and weigh up what’s in their interest. They saw that Georgia was defenceless and thought to themselves: “Why not?” “Let’s try to get the biggest piece of cake, or rather, the whole cake”, i.e. as I have already said, not only South Caucasus, but also the entire Central Asia. Their motto is: “Why not do it when we can”. If they haven’t the possibility to use force, they will forge more constructive links with Georgia on the basis of pragmatism and their interests. We have many common interests with Russia. No evidence of violence against the Russians living in Georgia was registered during the war. We have nothing against ethnic Russians or ethnic Ossetians. Today, there are more ethnic Ossetians living in unoccupied parts of Georgia than prior to the war. They have been living there up to now and there hasn’t been any case of ethnically motivated action against them. The same holds true for ethnic Abkhazians. We don’t harbour any hatred in relation to Russians. We have many joint interests in the field of economy, transport and energy, in terms of the fight against terrorism and aggressive separatism. We can and we must cooperate in the areas of security, economy, health service, education and science, environmental protection and culture. Our problems aren’t in fact our problems, but they are created by the Russian Federation. And the Russian Federation has real problems. It won’t be until the Russian Federation starts to treat us as a respectable and equal partner that we begin to collaborate with it. Now they are looking at us: “What are negotiations for when we can take it anyway.” When they won’t be allowed to “take it anyway”, they will start to deliberate on negotiations and ordinary and civilised relations. I agree, however, is it objective? This notion is based on imperialistic opinions. But is this notion objective and legitimate? I don’t think so. The world isn’t divided into spheres of influence. The Russian Federation does not have the right to regard Georgia as a part of its sphere of influence. The Russian Federation has the right to regard Georgia as its good neighbour. I mentioned that there is a confrontation between two ideologies, two mentalities, namely an imperialistic one and a liberal one. I think that Europe shouldn’t make concessions to imperialistic mentality. It is in its pragmatic interests. It may be in some politicians’ interests in the short term. However, if Europe admits that the Russian Federation has the right to exclusive influence on other states in the medium and long term, it will lose a lot. If Europe loses Georgia, South Caucasus and Central Asia, it will suffer from growing dependence on the Russian Federation right in times when it needs diversification and normal relations with the Russian Federation and not rising of dependence. Yes, if we collaborate, we are dependent on each other. But they want Europe to be more dependent on them than it is acceptable for it. Therefore these Russian opinions are illegitimate. Not only does it exist, these thoughts are typical for most of Russian politicians. It is a political mainstream in the Russian Federation. As far as this concept is the doctrine of the Russian state, Georgian NATO entry is apparently in contrast to Russian Federation’s interests and it would be a disaster for Russian geopolicy. I agree. But after this disaster they will grasp that it is not a disaster for the Russian Federation. Perhaps it is a disaster in their minds since it will be the demise of another USSR. Putin said that the biggest disaster of the 20th century was the dissolution of the USSR. And take a look now – was it a good thing or a bad one? A good one – of course. I don’t think that Europe is supposed to make concessions to people who have such bad opinions. When Georgia becomes a NATO member, they will comprehend that Georgia is a hard nut to crack and moreover, a nut which they cannot just eat. They will think like this: “What are we to do in order to achieve certain advantage in relation to Georgia”. This was also the case of Slovakia, the Czech Republic, Poland, Romania and other countries which were in the sphere of Russian influence. Nothing will happen to the Russian Federation if it is democratic. If you asked these people, who are thinking in terms of influence spheres, they would say that liberal democracy is bad for the Russian Federation because it can destabilise it. But that is not true. This used to be the point of Stalin, Lenin, Brezhnev and Chauchescu. But what was better for Romania, Chauchescu or the current supreme power? Thus liberal democracy is better for the Russian Federation than imperialistic way of thinking. Therefore we needn’t be afraid of it. We have to do what the voice of reason and general humanitarian principles as well as international law principles are telling us. We cannot dread the fact that they will think something. Let them think! In a peaceful way we have to make them change their mind and understand that totalitarianism is bad and liberal democracy is good. Do you think that after Georgian NATO entry the Russian Federation will start to forge constructive neighbour ties with Georgia? Are you not afraid that a vast conflict might precede the NATO entry, after it becomes obvious that the integration process will be completed? There is a real possibility that a second Russian-Georgian war may precede Georgian NATO entry. Nevertheless, they say you shouldn’t go into the forest if you are afraid. All of us have to pay a certain price for freedom. That’s our price; all nations have fought out their freedoms. This way has always been very difficult. Not a single nation did reach lofty goals without work or sacrifice. Now I don’t mean victims of war, we aren’t going to fight against the Russian Federation. Anyway, if there’s such a risk, we cannot give up the right way for its sake, the normal way of thinking and normal way of life. We cannot think like: “there is a risk of the Russian Federation using force, let’s forget about sovereignty, territorial integrity and democracy because the Russian Federation doesn’t want it, because Putin thinks something else”. Does it mean that you offer the risk of a war to Europe instead of keeping Georgia in the sphere of Russian influence? No, we don’t offer war against the Russian Federation; we offer peaceful solution to the given questions. There is a lot of other ways for averting any armed conflict. If Europe had assessed the situation adequately and had reacted to the provocations prior to 7th August, 2008 adequately, I mean Putin’s declaration from 16th April, 2008, through which the Russian Federation established official relations with separatists and transformed its peacekeeping troops into occupation forces, there would have been a big chance that the Russian Federation wouldn’t have undertaken such steps. However, there was no adequate reaction. If Europe reacts adequately, we may avoid war. We want Europe to use its potential in order to create a better life for its citizens via access to alternative sources, so that democracy is more widespread in the neighbourhood of the EU and stability and peace are promoted. This is to be attained in a non-military way. Unsettled conflicts in Abkhazia and South Ossetia along with tense relations with the Russian Federation amount to fundamental obstacles to Georgian NATO integration as for the fulfilment of accession conditions. Shall we expect a major progress in this field? Following the August war it is apparent to everyone that there are no real conflicts in the Georgian territory. There is just a single conflict between Georgia and the Russian Federation in which Russia uses certain methods of fighting against Georgia, including radical ethnic elements aimed against Georgian territorial statehood. Thus it provoked armed clashes on ethnic basis. If we normalised our relations with the Russian Federation, there wouldn’t be the Georgian separatist regions issue. Half a million, i.e. 70 percent of Abkhaz inhabitants, 300,000 of which were ethnic Georgians, were expelled from their homes. This situation isn’t normal. We offer these regions the largest autonomy. Yet prior to the war, there was a local administration led by Dmitry Sanakoyev in South Ossetia. Up to 2007 he was one of the leaders of the separatists: the Defence Minister and Prime Minister. However, he started to collaborate with central bodies because he believed in our proposals pertaining to the largest autonomy for South Ossetia and he accepted them. We don’t harbour any hatred towards the South Ossetians or the Abkhazians. Issues are to be solved very easily: the Russian Federation will quit backing financially, economically, militarily, politically and propagandistically the separatists and separatistic ideology. Europe has to make the Russian Federation yield up its aggressive policy in a non-violent way. I think that Georgia has to be and will be a NATO member, because if Georgia makes everything that is in our hands and what we can do, all criteria will be met. If the opposite party, Russia, doesn’t make adequate steps, we are not to blame. Therefore Georgia has to be a member even if the troops aren’t withdrawn from these territories. We remember Germany, half of which was occupied by Soviet troops, joining NATO. Time passed by and economic as well as democratic development and the process of the victory of democracy over totalitarian way of thinking have solved this problem. We are hoping that this will be the case also now. You know that these initiatives were formed as early as 2007. An interim administration led by Dmitry Sanakoyev was constituted in order to control a considerable part of South Ossetia. This territory was inhabited by the Georgians as well as the Ossetians. This question has been up-to-date already for several years and it is upheld by Georgian population in unoccupied territories as well as by ethnic Abkhazians and Ossetians in occupied territories. These can express their opinions freely. In occupied territories the situation is the same like in North Korea at the present or like in the USSR in the past. The people do not have the freedom of speech. If they say just a single word which is at odds with the occupation and separation policy, they may expect big troubles or lose their lives. This happened to many of them. We have to move forward carefully aware of the fact that these problems are perfectly solvable. Georgia meets all European standards of human rights protection and minority rights. It is prepared to provide the Georgian regions of Abkhazia and South Ossetia with much wider autonomous rights than minorities have in many European countries. We are ready to work out serious compromises unless they affect our sovereignty, territorial integrity and democratic and free choice. Which legislative steps has Georgia already made in this field? In the case of Abkhazia, in spite of the low number of ethnic Abkhazians, it would be the expansion of autonomy. We don’t want to do anything unilaterally, without the participation of all parties in concrete dialogue. We wish to make the given steps together with the EU and the international community. By all means. How could they agree when they are acting under Russian dictate? We have to make the Russian Federation change its imperialistic policy in relation to Georgia in a non-violent way. This is not only in the interest of Georgia, but also the entire Europe and NATO. Which concrete measures is Georgia taking with regard to the reintegration of Abkhazia and South Ossetia? We try to talk with the Russians in terms of the Geneva format, we try to explain our partners in the EU and NATO our position and work collectively. On the other hand we pursue democratic development and economic reforms in our state. We don’t wait until the Russian Federation yields up its position, but we do everything for the creation of better life conditions for all people in Georgia and for Georgia being a more European state. We prepare ourselves for the situation when Russia gives up its imperialistic ambitions, weakens its influence on occupied territories and leaves them. We prepare the breeding ground for democratic development. How about your prediction pertaining to the future of Georgian EU integration in connection with the current EU treaty stalemate? We perceive this question realistically. We know that Georgia isn’t prepared for EU membership and that the EU isn’t prepared to accept Georgia. Perhaps in not too distant future it will accept new members, for instance, Croatia, but definitely not Georgia. We are very sober as for the evaluation of our chances. EU accession is our officially declared objective that we want to conduct gradually, step by step. We are a part of Europe and gradually we plan to integrate into the EU as well. We estimate a time horizon of 10-15 years, but it is possible, that it will last longer or shorter. It will depend on the situation in the world and in Europe and on the development and market economy in Georgia.